Powerful and robust, Matrox Monarch HD offers simple, one touch stream and record pushbuttons, low power consumption, a locking power connector, and a fanless design. 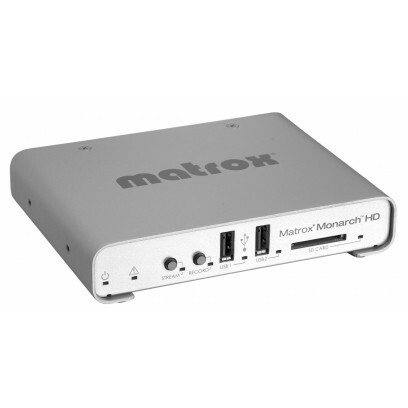 Matrox Monarch HD's HDMI output makes it easy to monitor what you are streaming and recording, regardless of whether the signal is received from a camera, a switcher, a signal convertor, or a computer. All eight channels of embedded audio can be passed from the HDMI input to HDMI output ports. Two channels of analog audio input with loopout are also available via 1/8" stereo jacks. Its design allows Matrox Monarch HD to be just as easily located on a desktop as in a rack–up to three units can fit in a single 1RU tray. The storage and button controls are conveniently located on the front of the unit while the power and I/O ports are found at the back. The Monarch HD firmware ships with a number of typical streaming and recording presets that define all the encoding parameters including resolution and bitrate. Whether preset or custom parameters are used, they only need to be entered once and saved as a unique profile. A profile not only contains encoding parameters but also destination information detailing where the encoded video is being sent. Multiple profiles can be saved if the device is used in different environments. Recording and streaming profiles are saved independently allowing a user to mix and match profiles depending how the Monarch is being used at the time. Each profile can be loaded instantly without having to re-enter data.